Minidump files can be an important tool for diagnosing why your application is crashing. It is important to note that this file alone will not often tell the entire story, so it is best to provide a minidump file along with a step-by-step recipe of what you were doing at the time of the crash. Nevertheless, if support is requesting a Minidump file from your system this article can teach you how to obtain one. 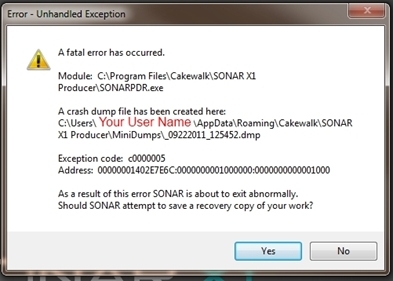 What if SONAR hangs and does not create a crash file? Open the Run Command by holding down the "windows" key on your keyboard and pressing "r"
Locate the .dmp files within. The .dmp files all should contain a timestamp of the time of the crash. So if it is 2/1/2011 at 10:26 am, your file should contain a title similar to "02012011_102620.dmp". This can be useful for locating the correct .dmp file if there are multiple listed. 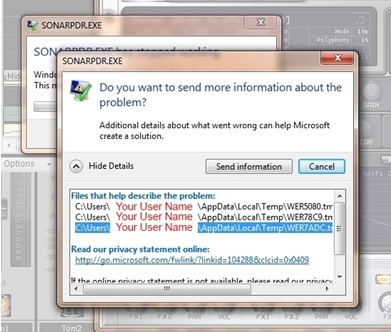 If SONAR does not create a crash file automatically, there are some additional methods for obtaining the file. Then you can click the "Show Details" button to find the location of the files related to the problem. Sometimes one of these files is a Minidump file itself. Collecting these files will be useful for support. If neither of the above dialogs were given then neither your Cakewalk software nor Microsoft caught the crash. You can manually try to catch these details by manually creating a MiniDump file. This process is different depending on which version of Windows you are running. 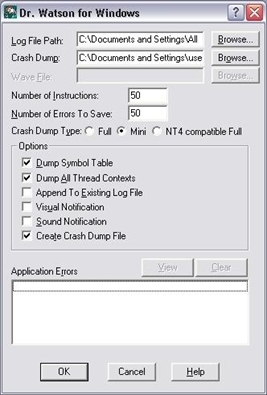 Check "Dump Symbol Table", "Dump All Thread Contexts", & "Create Crash Dump File"
Set "Number Of Instructions" and "Number Of Errors To Save" to 50. Uncheck "Append To Existing Log"
Note the location of the "Crash Dump" path so you can find the minidump file later. If necessary, change it to a better location. At this point, try reproducing the crash you are running into. This should save a Minidump file in the crash dump path location you specified in Step 4 above . The typical file name is "user.dmp". What if my software "hangs" and does not create a crash file? If your software hangs (goes white and/or stops responding but does not give an error code), another useful way of obtaining dump files from hanging applications is to use Microsoft's ProcDump utility. Please note that this is a more advanced technique that requires carefully following the instructions below. Command Prompt should tell you that it is "Writing dump file..." and it will tell you when it is done by displaying "Dump written."